The Armenian Highlands was an important center of early human technological and agricultural inventions. Situated at the crossroads between Europe, Middle East and Asia it served as a geographic conduit for the spread of technology and genetics into Europe during the Neolithic revolution when humans first abandoned hunting and gathering and started to settle down. The Armenian Highlands were crucial in this regard. The oldest center of stock farming can be traced to the Armenian plateau. In a paper: “Domestication and early agriculture in the Mediterranean Basin: Origins, diffusion, and impact” Dr. Melinda A. Zeder (2008) argues that the early spread of agriculture known as the Neolithic revolution spread from the Armenian plateau through a mix of colonization and cultural diffusion, into Europe and elsewhere. The indigenous hunter gatherers in Europe adopted the new farming technologies by cultural diffusion. Along with farming and the domestication of cattle came the consumption of milk. Research into the “milk revolution” in Europe has revealed that agriculture came to Europe amid a wave of immigration from the Armenian Plateau (a.k.a. Eastern Anatolia) during the Neolithic period. The newcomers won out over the locals because of their sophisticated culture, mastery of agriculture and their miracle food, milk. 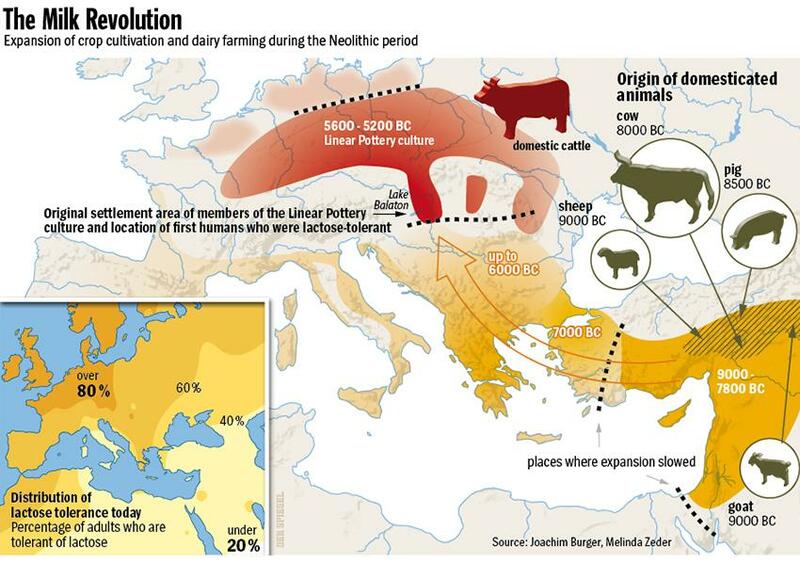 At around 5300 BC, everyone in Central Europe was suddenly farming and raising livestock. The members of the Linear Pottery culture (named after the patterns on their pottery) kept cows in wooden pens, used rubbing stones and harvested grain. Within less than 300 years, the sedentary lifestyle had spread to the Paris basin. The reasons behind the rapid shift have long been a mystery. 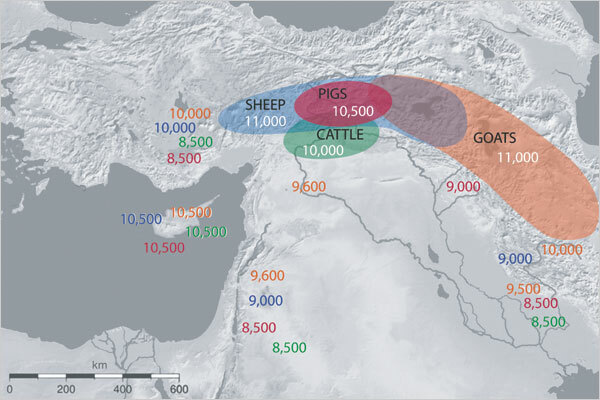 But in recent years excavations in Turkey, as well as genetic analyses of domestic animals and Stone Age skeletons reveal that at around 7000 BC, a mass migration of farmers began from the Armenian Plateau to Europe. These ancient farmers brought along domesticated cattle and pigs. To investigate the history of dairying in Europe, scholars from various European universities have organized a multidisciplinary project called LeCHE (Lactase Persistence in the early Cultural History of Europe), which brought together a dozen early-career researchers from around Europe. 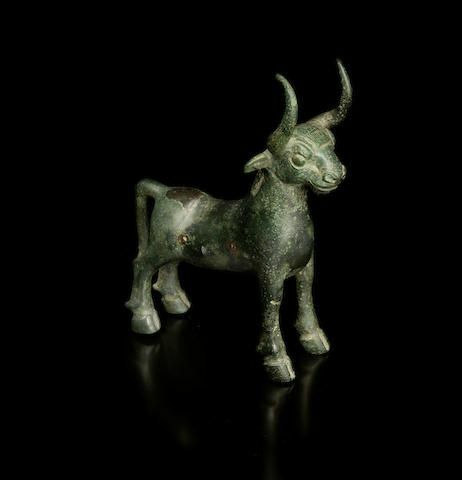 Araratian era bronze bull , Circa 8th-7th Century B.C. Their research revealed that during the most recent ice age, milk was essentially a toxin to adults because — unlike children — they could not produce the lactase enzyme required to break down lactose, the main sugar in milk. But as farming started to replace hunting and gathering in the Armenian Highlands around 11,000 years ago, cattle herders learned how to reduce lactose in dairy products to tolerable levels by fermenting milk to make cheese or yogurt. So the first farmers didn’t drink fresh milk but instead produced dairy products with less lactose. Several thousand years later, a genetic mutation spread through Europe that gave people the ability to produce lactase — and drink milk — throughout their lives. That adaptation opened up a rich new source of nutrition that could have sustained communities when harvests failed. It also provided people in Northern corners of Europe with, much needed, nutrition with calcium and vitamin D. The percentage of people with this modification today is the highest among Britons and Scandinavians. So the new settlers produced fresh milk, which, as a result of a genetic mutation, they were soon able to drink it in large quantities. The result was that the population of farmers grew exponentially. These striking insights come from biologists and chemists in a barrage of articles in academic journals like Nature and BMC Evolutionary Biology over the course of a decade. There are also signs of conflict. The intruders differed from the continent’s Ice Age inhabitants because of their different genetic lines. In other words, the two groups did not intermingle. 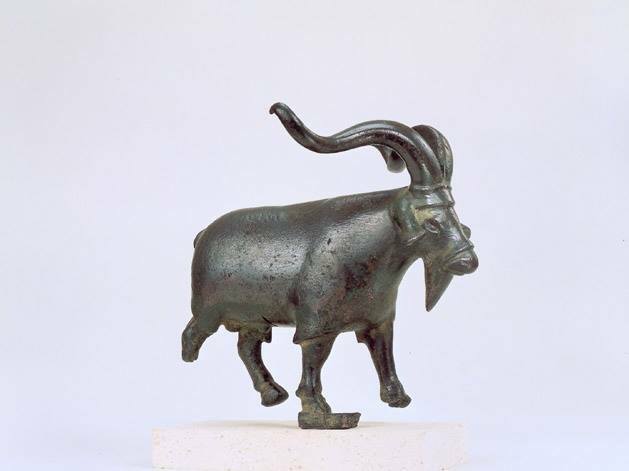 Goat (vessel stand) Bronze H 14.85 cm. L 16 cm Ararat Culture of Armenia early 2nd millennium B.C. It is clear, however, that the dairy farmers won out in the end. During their migration, they encountered increasingly lush pastures, a paradise for their cows. An added benefit of migrating farther to the north was that raw milk lasted longer in the cooler climate. All of this led to population growth and, as a result, further geographical expansion. Scholars are convinced that milk played a major part in shaping history, just as gunpowder did much later. says Joachim Burger, an anthropologist from the University of Mainz in southwestern Germany who is a member of the LeCHE team. 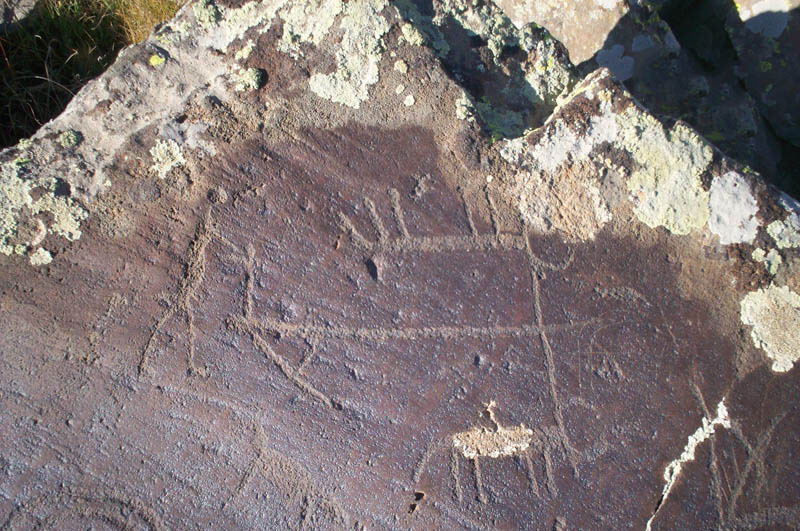 In their quest to discover the history of dairying scholars from various disciplines have uncovered the origins of this practice and trace it back to the Neolithic Armenian Highlands (or as it’s sometimes called Eastern Anatolia). Some of the LeCHE participants are probing further back in time, as part of a project named BEAN (Bridging the European and Anatolian Neolithic), which is looking at how the first farmers and herders made their way into Europe. They regularly visits Turkey in order to trace the origins of the Neolithic using computer models and ancient-DNA analysis in the hope of better understanding who the early farmers were, and when they arrived in Europe. The ancient tradition of dairying in Armenia is reflected in traditional Armenian cuisine which is rich with dairy products including many types of cheeses and yogurts such as Matzoon; a fermented milk product of Armenian origin, or Tan, a savory Armenian yogurt drink made with yogurt, cucumber, water, salt, and fresh herbs such as parsley or mint. Interestingly enough Yogurt was popularized in America by Armenian migrants Sarkis and Rose Colombosian, who started “Colombo and Sons Creamery” in Andover, Massachusetts in 1929. Colombo Yogurt was originally delivered around New England in a horse-drawn wagon inscribed with the Armenian word “madzoon” which was later changed to “yogurt”, the Turkish name of the product, as Turkish was the lingua franca between immigrants of the various Near Eastern ethnicities who were the main consumers at that time. Yogurt’s popularity in the United States was enhanced in the 1950s and 1960s, when it was presented as a health food. By the late 20th century, yogurt had become a common American food item. I’m half armenian and I am lactose intolerant. If genetics of Armenians have pretty much stayed constant..shouldn’t that be true of most full blooded Armenians? I am not entirely sure what you are asking. But the first people who domesticated cattle and used milk in their diets were actually lactose intolerant as well. That is why they made dairy products from fermented milk like cheeses and yogurt which contain less lactose. The gene for tolerance was only developed later. May be your ancestors mixed with some Mongol people (Mongols dominated Armenia for near two centurys). They are intolerant to cow lactose, only drink fermented yak milk. The prononciation of yogurt is changed by turks the correct is yough – hort and in Armenian language this composed name mean yough=butter, hor=cows. So this is the correct way to know the origin of civilization, where nomad peoples try to change the history. Wow I gladly read your explanation. Always proud to be Armenian. There is another explanation for the etymology of yoghourt which was originally ‘youghvort’. ‘Yough’ is fat or butter while ‘vort’ is the bacteria. For the same reason we say ‘vortadoung’ to the grape bush. Yes, I think that is the right explanation. I guess people at that time knew that something “small enough and not seen to naked eyes” was converting the milk. Furthermore, this might interest you too, Mkhitar Heratsi gave a notion of “infection” for the first time in history of medicine (officially accepted) in his book “Djermants Mkhitarootyun – Ջերմանց մխիթարութիւն” – Relief of Fevers, 12th century AD.